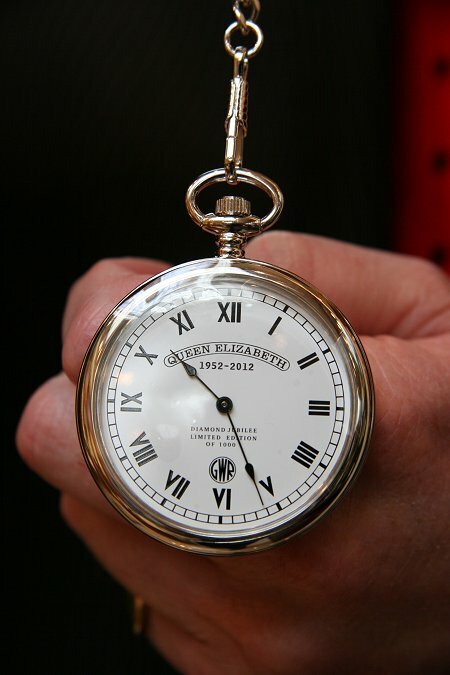 The history of time itself is being celebrated this month to mark the Queen's Diamond Jubilee year. 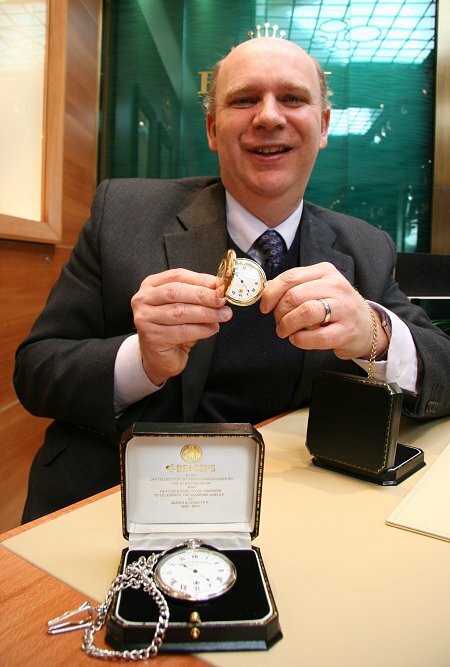 Swindon's oldest jeweller, Deacon & Son, and the STEAM museum have teamed up to produce a range of limited-edition pocket watches to honour Queen Elizabeth's 60th year on the throne. We interviewed Richard Deacon & Ian Surtees about the watches for The Swindon Show, and you can see the video below. Chrome plated Open Face Pocket Watch, 17 jewel, hand-wound mechanical movement, on a chrome plated single watch albert chain. 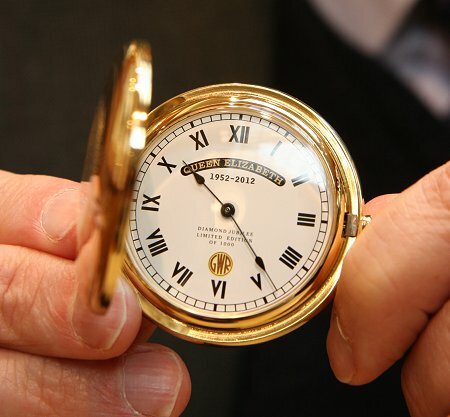 White Roman numeral dial with black spade hands featuring the Queen Elizabeth name plate and GWR logo. Beautifully displayed in a presentation box. Gold plated Half Hunter Pocket Watch, 17 jewel, hand-wound mechanical movement, on a gold plated single watch albert chain. 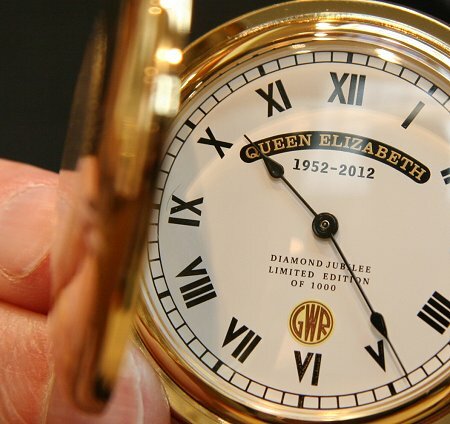 White Roman numeral dial with black spade hands featuring the Queen Elizabeth name plate and GWR logo. Beautifully displayed in a presentation box. 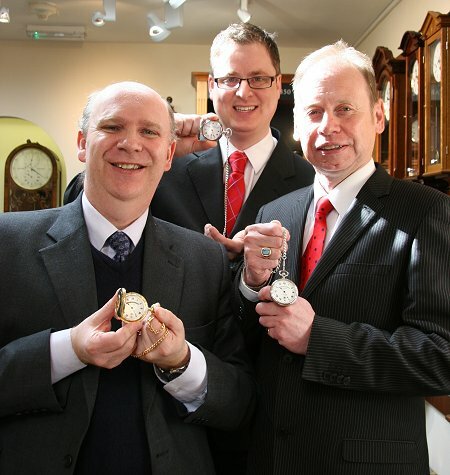 Deacon & Son originally made a wide variety of timepieces for the GWR (Great Western Railway) including station clocks, ornate mantel clocks and, of course, pocket watches for station masters and guards, so current owner Richard Deacon is delighted to be working with STEAM on the project. "Planning these timepieces has rekindled past ties with Deacon's and the railways and helps us celebrate Swindon's proud railway history and the Queen's jubilee. "I feel it so appropriate because my forbearers came to Swindon in 1848 to keep the trains on time." The watches go on sale on Saturday 14 April from Deacon's Jewellers main store in Wood Street, Old Town, Swindon. 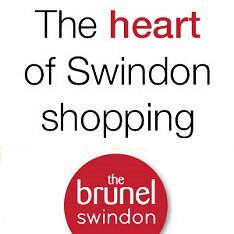 Watch the Swindon Show on Monday for an interview with Richard Deacon & Ian Surtees at STEAM Museum describing the watches. For more information on the Deacon & Son Limited Edition watches, please visit their website via the link below.